I only wish The Grove at Fenwick Plantation had been around when I was starting out. It is the perfect spot for young professionals to enjoy the Charleston lifestyle without busting their budgets. For starters, The Grove at Fenwick Plantation is located amid huge moss-draped live oaks that have stood silently for centuries, looking on as history unfolded. Originally inhabited by Indians, this parcel of land on Johns Island has seen many owners and played an important role in both the Revolutionary War and the Civil War. Today, the land is inhabited by people seeking a unique lifestyle. The Grove at Fenwick Plantation is just minutes from the charm and sophistication of downtown Charleston yet miles away from the stress of city living. Johns Island is still a bit rural, but there are many conveniences nearby, including shops, grocery stores and a variety of restaurants. "It-s tucked away and accessible, but you get to appreciate Johns Island living," says Will Jenkinson, broker in charge for Carolina One New Homes. "It-s great for first-time buyers." All condominiums at The Grove are a comfortable size, featuring two bedrooms and two full bathrooms in approximately 950 square feet of living space. There are 80 units spread among 14 landscaped buildings. Whether on the ground floor or second level, each home has a private entry. Outdoor living is encouraged with a resort-style pool and lounge area and a clubhouse. A children-s recreation area is nearby. The homes start at $109,000 and offer maintenance-free living. According to Jenkinson, some buyers may be eligible for a $5,000 option that can be used to assist with closing costs, for a job-loss protection program or to select paint colors or flooring options. FHA and VA financing plans are available, and first-time buyers can make use of the federal government-s $8,000 tax credit. "FHA financing will have a big impact," Jenkinson says, adding that "it allows buyers to make a down payment of only 3.5 percent of the purchase price. And that money can be gifted, which helps young buyers." 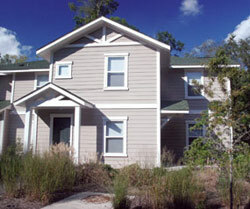 The Grove at Fenwick Plantation is located at 15 Stardust Way on Johns Island. From Maybank Highway, turn right on River Road and drive about a mile to the entrance.